We highly recommend you have us maintain your dryers and refrigerators. If your dryer's vent gets clogged with lint, it can burn the motor up and cause a fire. Your refrigerator needs it's condenser coils cleaned to ensure it runs efficiently. Your washer's drain pump and components should be examined as well to keep them in proper running order. Count on our Appliance Repair company in Dallas TX and surrounding area's , for quick and reliable appliance repairs, and maintenance services. Extreme Care Appliance Maintenance and Repair can Service & repair any brand of appliance for your home or business. We can normally do repairs the same day, but if not that day, within 24 hours. 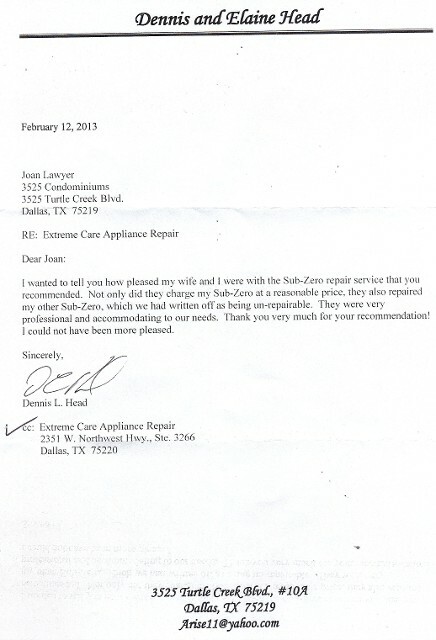 Call us today at (972) 505-3390 and (972) 505-3390 for same day appliance repairs and maintenance. Extreme Care Appliance Repair can repair almost all appliances, including gas and electric ovens and dryers. Our technician is a sealed-system refrigeration specialist that has all common parts on hand to make repairs. If we don't have the parts we can order them and then set up a date for repair. If we are unable to make the day, you get the part for free. Extreme Care Technician's has many years of experience in the industry and can professionally service all appliances. Included we will program your appliance, make sure everything is working properly, and give you a quick run down on how to use your new appliance. Extreme Care Appliance Repair can help keep your appliances working at there best with our maintenance agreements. We recommend having maintenance checks twice a year and we can usually throw all appliances on one agreement to save you money. By having us maintain your appliances it keeps your warranty in good standing.